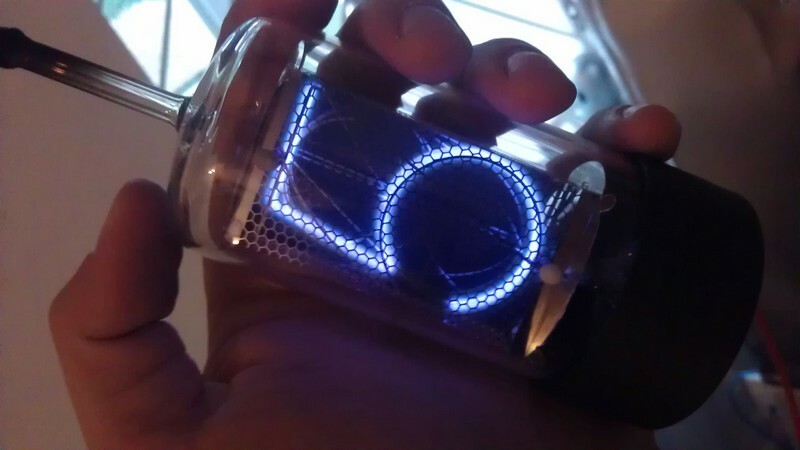 Our regular nixie tubes use neon/argon mixture which provides very bright light with low power consumption. I experimented with different mixtures in the past (argon, helium), the result was very dim – far from what you know from regular nixie tubes. Moreover, the electrical parameters (striking voltage, current) were high, making it impractical for regular use. Also the heat dissipated on the cathodes was high, I expect very high sputtering rate and low lifespan of such nixie tube. Argon gives blue/purple light, barely visible in daylight. Helium is purple/pink, slightly brigther than argon. Xenon and krypton should give white/blueish glow – I haven’t personally tried yet. An example of argon filled nixie tube is below – the photo was taken in dark room, long exposure, tube was running at very high voltage and current. Actually, the brightness was much lower than it might seem from the photo.